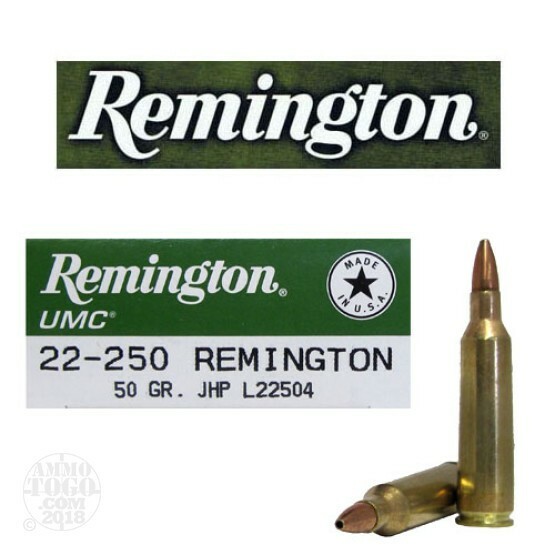 Remington’s UMC line of ammunition is ideal for any number of applications: varmint hunting, shooting targets, old-fashioned plinking, or really any other reason for which you’d like to fire a great many rounds without having to pay dearly just to enjoy the experience. This 22-250 cartridge is particularly well-suited for ridding the world of pests like crows, prairie dogs, and woodchucks, as its 50 grain bullet’s hollow point ensures it will begin to mushroom rapidly upon impact, ending their unwelcome tenure on your land as quickly as it began. This bullet’s jacket serves to control that rapid expansion, and further assures that your rifle’s bore won’t become caked in the kind of lead residue which would gradually deplete its accuracy. A UMC round always comes with a uniform and factory fresh brass casing, so you can keep this particular cartridge in play for use over the course of multiple hunting sessions if you’ve a reloading bench at your disposal.